10 people gather in a circle for the beginning of an AXIS Dance "community dance jam" -- a workshop in an improvised dance form known as "contact improvisation." AXIS Dance instructor Sophie Stanley asks the participants to warm up by saying their name and then physically expressing how they feel. Stanley goes first. “Sophie. Squirmy,” Stanley says, and wiggles her body like a dog getting out of the water. "Kirsten. Excited," says a class participant and hops up and down to show her feelings. It’s easy to find dance classes in the Bay Area if you get around on both legs. 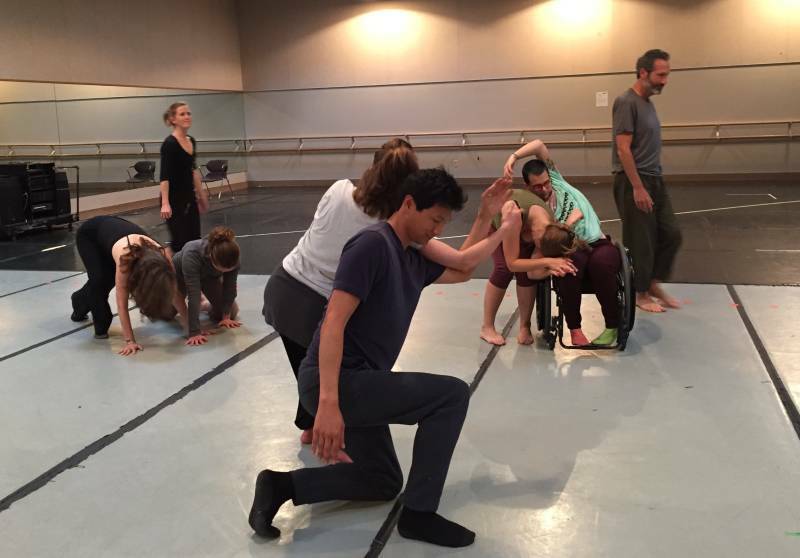 This class at AXIS’s studios at the the Malonga Casquelourd Center for the Arts in Oakland is one of the few options for people who are disabled. 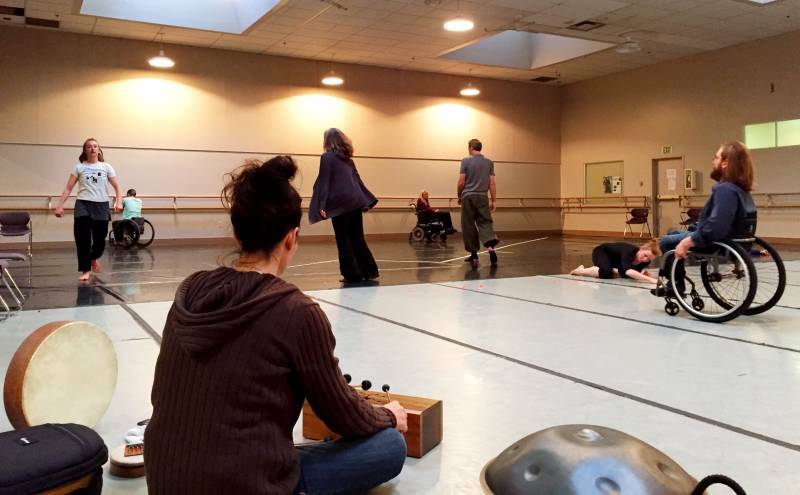 AXIS Dance co-founder Judith Smith is in the circle. Smith grew up in Colorado riding and jumping horses until a car accident cost her the use of her legs. In the early 1980s, she moved to Berkeley, which was at the time a center for disabled activists. “One of the first things that happened was I met a woman and I started doing improvisational movement with her,” Smith says. “And it just really changed my life. I gained a lot of strength, balance, coordination, and a kind of confidence I hadn’t had in five years." 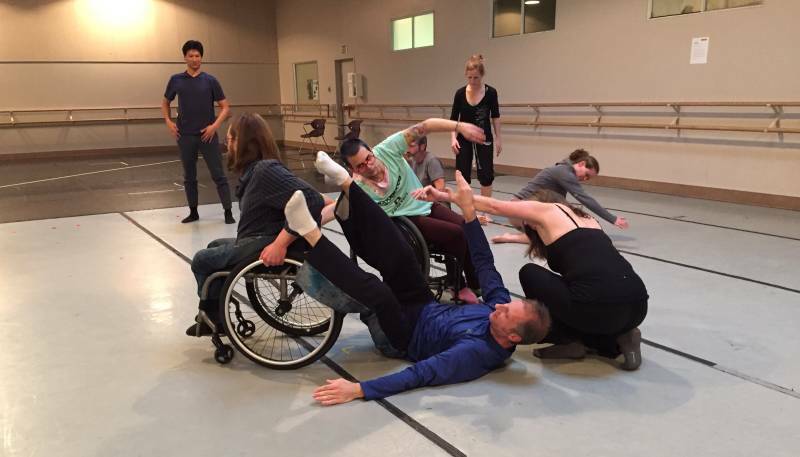 That’s when Smith started AXIS Dance, now one of the Bay Area’s top professional dance companies, and one of the few around the world whose performers include both able bodied and disabled dancers working together. 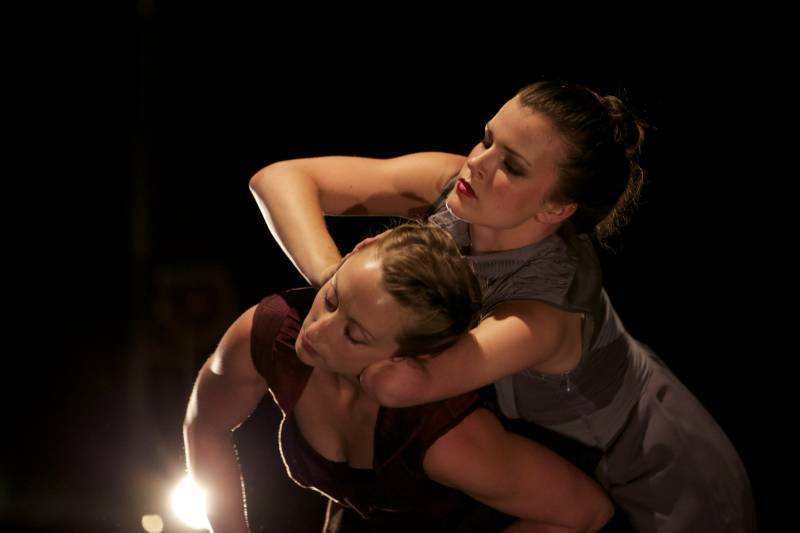 (AXIS Dance's professional company will present a new piece by Joe Goode on Saturday, Apr. 23 at Bing Hall on the Stanford campus.) Smith says the community dance jams are a way to share the experience with anyone who wants to move -- not just professionals. Smith uses a motorized wheelchair to get around. During the jam session she sometimes speeds around the room, her white hair streaming behind her while others in the class mush together and separate in improvised duets and trios. Multi-instrumentalist Laura Inserra provides an ambient musical background, playing hang pan drum, Chinese mouth organ, and flute. A dancer in a wheelchair grabs someone’s hand and the two spin as though caught in each other’s gravity, smiling and giggling. June Kogut, a participant in the jam who uses a wheelchair, works with LGBT youth in the East Bay by day. Dancing is her hobby. “It’s really fun to be like spun around, or lean on people,” Kogut says "It helps other people out too; they put their weight on my chair." Derrick Williamson also uses a wheelchair. He lives and works in the South Bay, making the drive all the way from Sunnyvale to Oakland in rush hour traffic. “After two hours of what should leave me feeling worn out, I leave this place with more energy and feeling better than ever," Williamson says. The next AXIS Dance Jam happens on Monday, May 23 at Malonga Casquelourd Center for the Arts in Oakland. Find out more here.